Weatherproof and supportive hiking shoe packed with trail running technology. A synergy of technologies, Tsunami Mid is a multi-activity shoe packed with features from both our hiking and trail running ranges. WEIGHT: 880 gr. pair. Size 7 U.K. Built on the outsole platform of our Saurus trail running shoe, Tsunami Mid gives a superbly cushioned feel with excellent grip from the high friction Vibram Megagrip® rubber compound. The uppers are made from lightweight synthetic textile with a TPU injection overlay for added abrasion resistance and support. With an ankle height cut, Tsunami Mid provides a little more ankle support that a low cut shoe. Inside you’ll find a class leading Sympatex Moisture Tech® waterproof lining for all weather comfort, come rain or shine. Tsunami Mid feels as light and cushioned as a trailing running shoe but has all the weatherproof ruggedness and performance you’d expect from a hiking shoe. Weatherproof hiking shoe packed with trail running technology. A synergy of technologies, ​Tsunami Mid is a multi-activity shoe packed with features from both our hiking and trail running ranges. 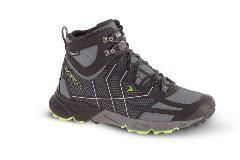 Weatherproof hiking shoe packed with trail running technology. A synergy of technologies, ​Tsunami is a multi-activity shoe packed with features from both our hiking and trail running ranges. Built on the outsole platform of our Saurus trail running shoe, Tsunami gives a superbly cushioned feel with excellent grip from the high friction Vibram Megagrip® rubber compound. A no-compromise shoe built for the mountain. Drom packs all the performance features you need and will take you where you want to go. Perfectly at home walking to your local crag or high in the mountains, Drom is like a 4x4 for your feet.